So curious about the Cronut ! The American dream certainly lives on in the form of the cronut. What a discovery! Since I read about the birth of the cronut in May, I have been curious… so very curious that my mouth waters when I hear about the long queues and waiting lists to get one. How will I manage to try one stranded on this tiny beautiful Mediterranean island? 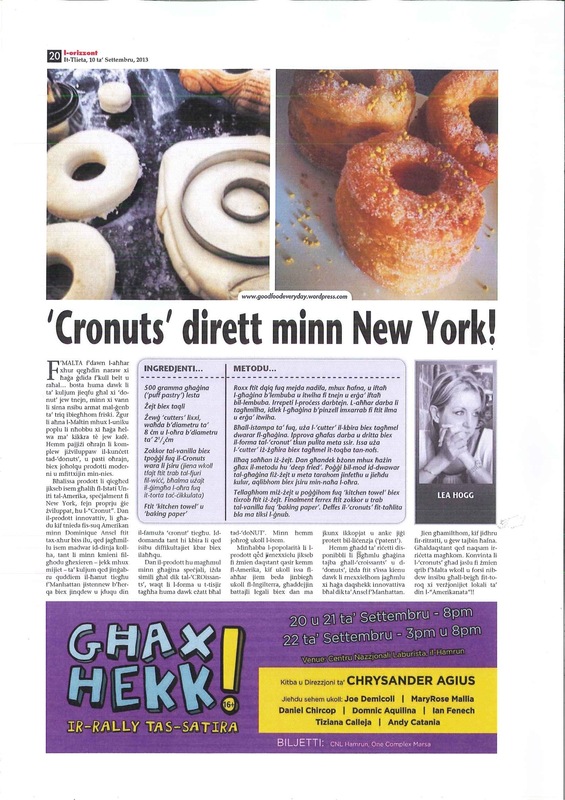 So after two months of Cronut dreams, I cannot deprive myself any more and today is the day when I go the home made route and bring Manhattan to my kitchen…. The result is great, not sure if it tastes like the real thing but certainly looks like it and they are delicious…. I so love New York ! Well done Dominique Ansel www.dominiqueansel.com you are a genius …. I dusted them with pollen..(optional). The calories will not go away but it is nice to include a superfood, somehow makes me feel a little less guilty about indulging. I will post a good recipe for puff pastry later today but the shop bought pastry worked just as well. The taste was very similar and it was hard to identify the different doughs. Dust the table with flour and roll out the prepared puff pastry very gently, fold into two and roll out again. Repeat this twice. The last time you do this, brush the pastry with water very lightly before folding it and gently pat it with the wooden spoon. Using the large cutter, cut out rings of pastry, pushing the cutter sharply and gently once so that the edges are neat and well defined. 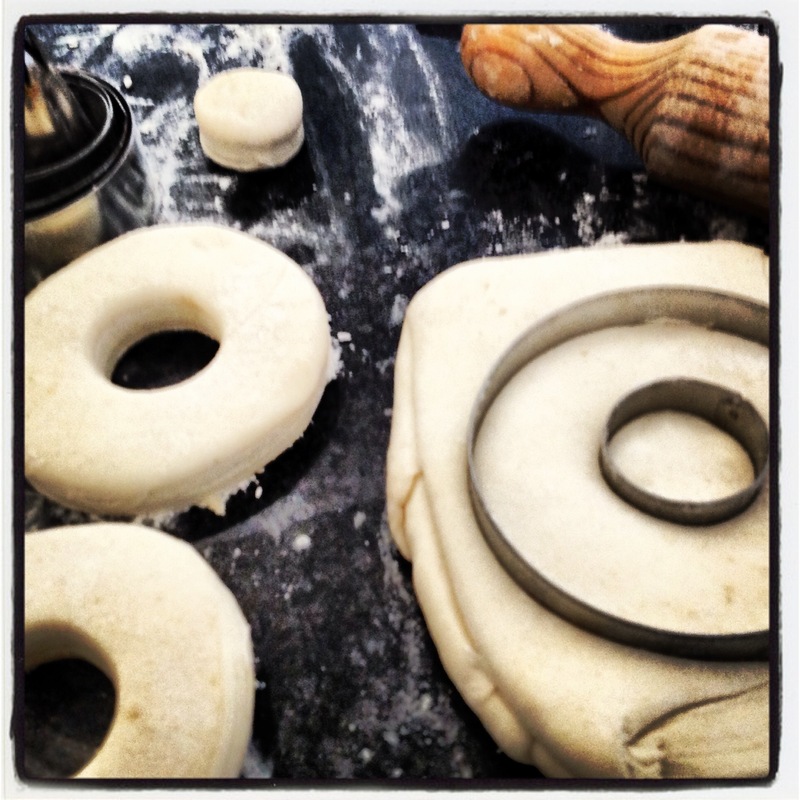 Using the small cutter, cut a whole in the middle of each pastry round, again tap cutter sharply and gently. Heat the oil and test by putting in a very small piece of pastry and it should float to the surface. This is a deep fried recipe so you will need quite a large amount in your pan. Remove from pan and place on kitchen towel to absorb some of the oil. Prepare a baking sheet with sugar or vanilla sugar. Roll the Cronuts in the sugar. I think they look better with the sides unsugared as the layers are so beautiful that it is a pity to cover them. 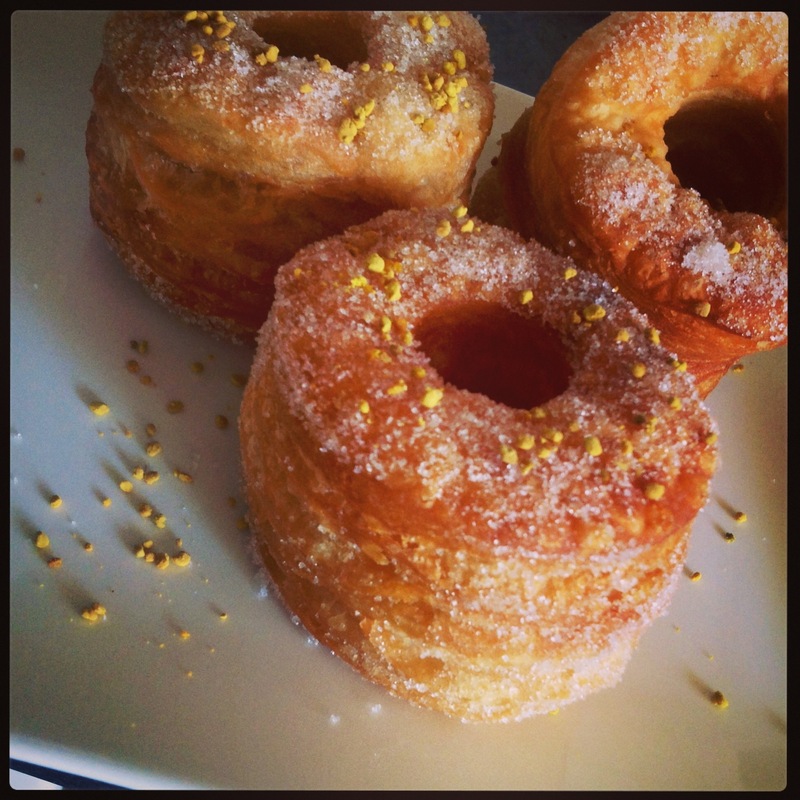 Plate and I sprinkle some pollen on them which make them even prettier… gives the cronut a breakfast feel. The pollen flavor works very well. And in the newspaper here ! ← Carob Syrup from the heart of the Mediterranean! Thank you for reblogging my cronut piece, so appreciate ! It made me hungry, thats usually the hint I need to reblog. Have a safe happy Sunday. Those are SOOOOOOOO beautiful and delicious looking. Please tell me that you have that picture framed on on your wall. Fabulous. Yes the are good ! Let me know if you try them out ! Have a lovely day ! Thank you ! We made some with a variety of toppings last weekend but I still prefer these plain ones ! Thank you, so appreciate your feedback ! Never knew there was such a thing. Grew up on donuts in NYC (which I have long since disavowed). Thank you, i just saw your comment and apologies for not responding before but I missed it. Yes easy to male at home. Let me know how they turn out ! Thank you, delighted to hear from you! So appreciate. What i do is with great pleasure from my heart, a joy for me to share !